Finally, a way to travel in comfort, style, and safety while you sleep! My husband and I have done our share of road trips, usually camping out in a tent, but often sleeping in motels or cabins. Unfortunately, some of our most memorable stays have been in motels where we had to sleep in our clothes and sleeping bags on top of the bed because we didn’t dare sleep between the sheets! With BedVoyage, this apparently doesn’t have to be the case any longer. Made from bamboo, BedVoyage offers beautiful travel sheets and a new travel blanket that are all naturally anti-bacterial, odor resistant, and hypo-allergenic. Not only is bamboo an awesome sustainable resource, but the fibers allow you to always be comfortable–cool in the summer, warm in the winter and dry (since it wicks moisture away). Why for Valentine’s? When preparing for this Valentine’s event and contacting companies, I thought BedVoyage would be a great one to include because, hey, who wouldn’t want to take a romantic rendezvous somewhere? On the other hand, for people who don’t have anyone to go anywhere with, or who have kids and so travel is out of the question, this is still a fabulous product! It’s something that everyone can use and enjoy regardless of if it’s on the road or at home…and I know that I always feel better having silky warmth next to my skin that I know is safe for everyone. There’s no better way to relax at night! My Thoughts…BedVoyage had just released their new travel blanket when I contacted them, and so asked if I would review it for them. When it arrived, I was first taken back by the absolute soft, silky feeling it has (and the packaging said it will just get softer with washings!). 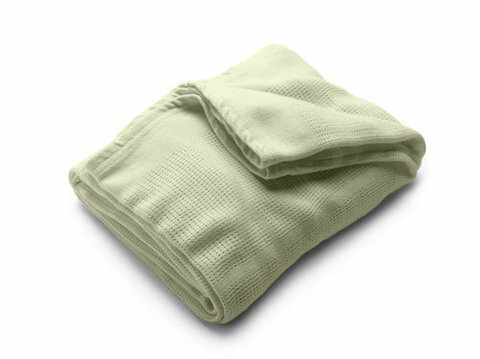 I have a few bamboo shirts, and love, love, love the feel of them, but this blanket was even softer than I’d expected! The sage green color also impressed me because it’s just a nice, neutral, relaxing color which I definitely appreciate when I’m trying to get into a relaxed mood. I first used it to snuggle up with my daughter to nurse and take a nap on our couch together and was delighted at how warm it kept us. The blanket is so thin that you wouldn’t think it’d be real warm, but it works fantastically! The only thing I’d like to see different in this blanket is that it could be offered in a variety of sizes (this one would fit a single/double sized bed) and colors. I would definitely recommend this as a travel and anytime blanket because of it’s eco-friendly properties, comfort, ability to be compact, and cost. BedVoyage bed sheets are exquisitely woven to accentuate the incredible softness of bamboo with a sprinkle of natural sheen. These 100% organic bamboo sheets are subtly cool and extremely breathable, with a feel softer to the touch than a 1,000 thread-count cotton, and they are non-pilling. Bamboo is known to be one of the strongest natural fibers, which makes this BedVoyage product especially appealing because of its longevity, durability and easy-care. Those with sensitive skin will benefit from the all-natural round bamboo fibers which contain no harsh chemicals or synthetic substances to irritate the skin. Studies have shown that children are suffering from allergies today more than ever, BedVoyage’s linens provide an allergen free sleeping environment both on the road and at home, as bamboo is grown organically with no pesticides or fertilizers. Buy It! Make yourself or someone else happy this Valentine’s Day and snag something from BedVoyage at their website: http://bedvoyage.com/. Free shipping through February! Win It! BedVoyage is giving one of my readers her own bamboo travel blanket! Since it is Valentine’s Day, all you have to do is tell me why you want to win this below. You must include an email address and separate comment for each entry. Contest will end 2/15/10 at 11:59, EST. – Visit BedVoyage and find something interesting from their site to tell me that’s not in this review and that no one else has commented on yet. I recommend visiting their Travel Tips or Bamboo Information pages. Review is based on free product sample provided by BedVoyage. No other compensation was received. I watched their information video and learned that bamboo is naturally antibacterial, odor resistant, anti-mite, hypoallergenic, and anti-microbial. That's a great quality to have in bedding. Another thing that I like about it is that they are soft. They say that it's softness is between cashmere and silk. That's very intriguing to me because everyone loves softness! We take car trips frequently and this would be handy blanket to have in the car for our older son to sleep with while we are driving. I entered the Friendship Stone giveaway. I'd like to win this because we keep the heat turned down in our house and always need more blankets. Plus I'm curious about a bamboo blanket.